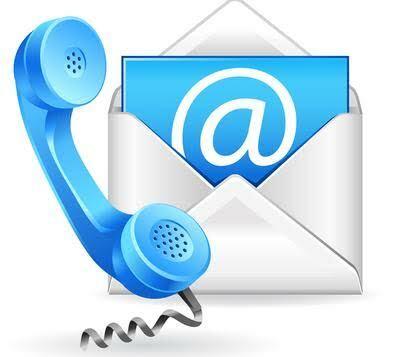 From InsurFact's Desk Manage Attachments Reliably - MARS! Provides you with your Own Digital Footprint! Quote Life, Critical Illness & Disability Insurance Investment Funds Research Tool! GIC Rates for RRSP, RRIF and Guaranteed Investments! Mortgage Insurance and Rates from top Banks in Canada! "You don't have to see the whole staircase; just take the first step." At the early age of 8 years old, Chuck Copoloff, InsurFact's founder, has been first and foremost a visionary. As a small boy, he saw that one day trains would levitate on magnetic tracks; as a pre-teen, he gave his father a crayon colored design for what he called a grass-leaf picker upper; and as a young man in his early twenties, he saw that there would be a day that insurance agents would be gazing out at the ocean and doing business from some sort of hand-held device...something a good 15 years later we would come to call a 'smartphone'! After graduating from Concordia University in Montreal, Quebec with his degree in Finance, he chose to study for his life insurance license. And, in 1984 he started what would become a 30 year insurance career working alongside his father and sister at his dad's MGA. During this period of time, aside from creating marketing campaigns and helping to build the Agency, Chuck spearheaded and launched InsurFact 1.0. This early version of InsurFact was pre-internet as we know it today and Chuck was often referred to as ahead of his time. He created the first online quote system for agents, at a time when agents were just getting familiar with computers. Company's and agents alike, viewed the idea of connecting to another computer via a device called a modem, revolutionary! Today as the 'Net is fully meshed in our daily lives and being connected 24/7 is a 'must have' to function in today's world, Chuck's hand-held device vision is finally a reality! The only piece missing, is a state of the art software solution to bridge the gap between working in an office and functioning on the Internet. 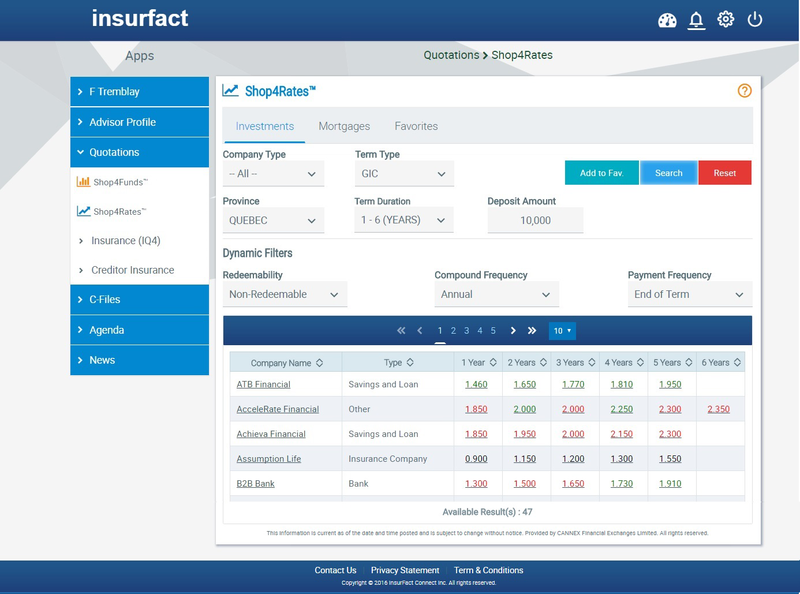 This is where InsurFact 2.0 comes to the forefront. More than 10 years ago, InsurFact made a strategic decision to only provide its services on the Internet. We learned many technologies during that period of time and now, with web-services the norm and insurance companies offering e-apps and many online tools that have replaced traditional CD based software, we proudly Welcome you to C-Files and our vision. C-Files is a one-stop-shop online software, that provides you with the ability to research the funds market, shop for fixed-GIC investment products and quote a multitude of insurance products ranging from life, critical illness and living benefit plans. After quoting and selling, we give you the platform to manage your policyholders and keep in touch with your clients. Best of all, everything that we create, is designed to be easy and intuitive. No need to spend hours and days learning our program. You can be up and running within minutes! It's that easy! And so, please join us through the vision of C-Files and let us help you build and manage your business. And with a little bit of planning, you too can enjoy some time at the beach and manage your business with your hand-held device! Easy and quick to learn, try C-Files free for 14 days and see for yourself if our software and vision is right for you! Yesterday is over, today is a new day and tomorrow is full of hope and excitement. Welcome to C-Files and your digital footprint on the 'Web! C-Files provides management of all your business information that includes: provincial licences, E&O policies and carrier contracts. Send documents directly to your MGA/AGA and Insurer's you are contracted with - ensuring that your commissions are paid on time and in compliance with provincial regulations. All saved quotes are managed in your C-Files follow-up calendar and gives you reminders when to follow-up with your clients. C-Files provides you with 5GB of storage room in our MARS Cloud. This allows you to manage your attachments & documents reliably and create a filing cabinet for each of your prospects, clients and business documents. Quote and compare life insurance plans ranging from term and permanent insurance. We even provide creditor insurance plans for your research needs from leading banks! Quote Critical Illness plans and easily filter through the number of illnesses covered from one plan to another. And, you can even quote Simplified Disability and Long Term Care plans! 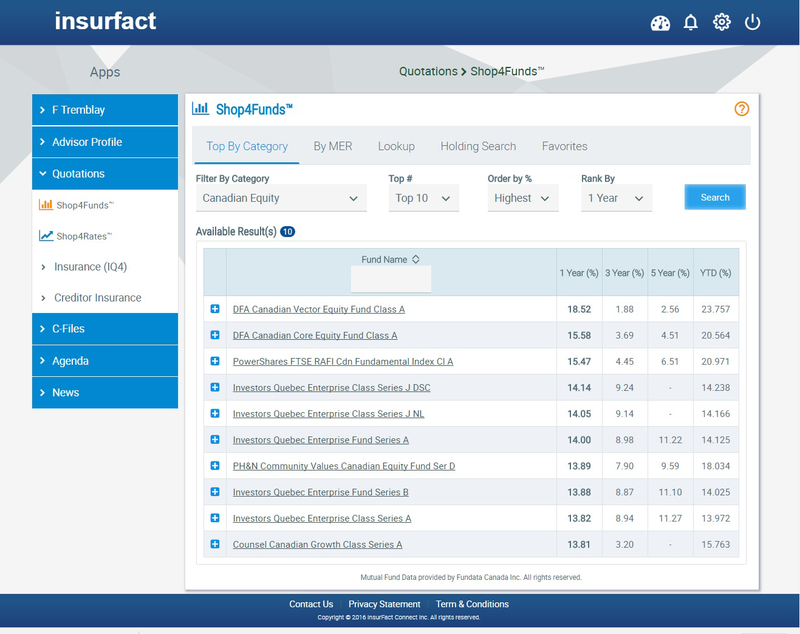 Use Shop4Funds for your research needs that gives you tools to filter through data from thousands of Segregated and Mutual Funds in Canada. Data updated daily from Fundata! GIC's ( both registered and non-registered) and mortgage rates are updated daily providing you with a reliable service to monitor rates from leading financial institutions in Canada. Data updated daily by Cannex! All our software is made with simplicity and intuitive programming in mind. This allows you to be up and running within minutes! With over 25 years of infrastructure management and tier-one hardware and software running InsurFact, we have the experience and proven reliability to back up our claim of SOLID! We run our services similar to the way banks and financial institutions protect their client files. That means using best of line processes and protection tools available today! Experience is not just about how long you have been doing something. Experience is knowledge. Experience is reliability. Experience is results. That is the experience behind InsurFact and its 30+ year business continuity. C-Files is a software with a solid security infrastructure in the cloud with a nice easy-to-use interface. And it's easy to operate from any computer or tablet, is fast and efficient and available 24/7! Take a look at a few screenshots of C-Files!. C-Files provides management of all your business information that includes: provincial licences, E&O policies and carrier contracts. And, it is lets you send documents directly to your MGA/AGA and insurer's you do business with - ensuring that your commissions are paid on time and in compliance with provincial regulations. Quote and compare life insurance plans ranging from term and permanent insurance and critical illness plans and easily filter through the number of illnesses covered! We even provide creditor insurance plans for your research needs from leading banks. Use Shop4Funds for your research needs that provides tools to filter through vast arrays of data from thousands of funds in Canada. GIC's ( both registered and non-registered) and mortgage rates are updated daily, providing you with a reliable service to monitor rates from leading financial institutions in Canada. The power is in your hands, subscribe today! Ask us for a trial subscription to evaluate if C-Files is the right software for you! INSURFACT CONNECT INC. STANDARD TERMS AND CONDITIONS. 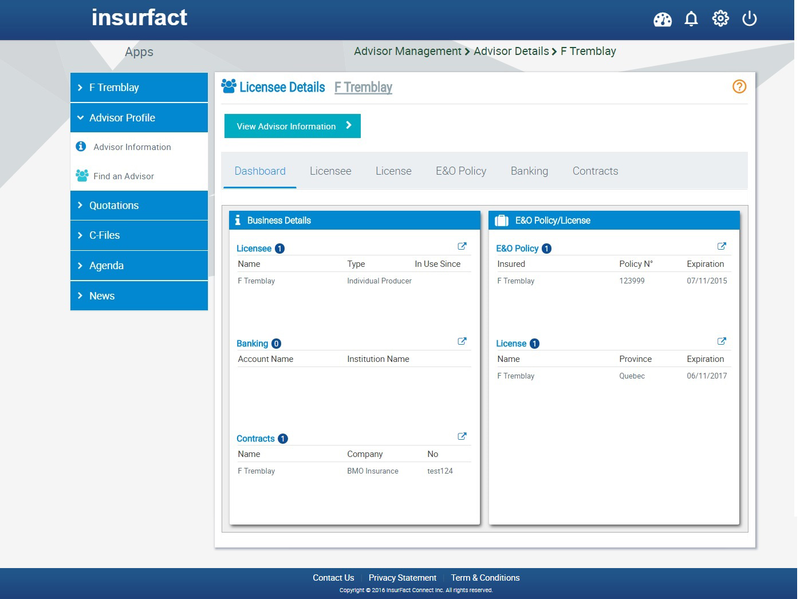 InsurFact Connect, Inc. ("lnsurFact"), with an address of 2572 Daniel Johnson Blvd., Laval, Quebec, H7T 2R3, Canada, grants to you a non-transferable and non-exclusive license to use its software products. The use of such InsurFact software shall be governed by the following terms and conditions. Upon acceptance of this order by InsurFact at its home office, InsurFact also grants to you during the terms of this agreement 1) a right of access to its data and services through a personal computer or other devices connected to the Internet and 2) use of the InsurFact business management services as more particularly described in the documentation, price schedules, manuals and materials prepared or compiled by InsurFact and furnished to you in connection with your purchase order and 3) other professional services including, but not limited to special studies, systems analysis and design, programming and program development, system conversion, implementation planning and evaluation, documentation and training as requested by you. InsurFact reserves the right to add or withdraw data or services and modify or otherwise change the services without notice. This agreement is effective from the date of acceptance by InsurFact and shall continue in full force and effect for a period of 12 months, thereafter, until terminated by either party upon at least thirty (30) days prior written notice to the other party. You acknowledge that InsurFact software is copyrighted and constitutes the valuable proprietary information and trade secrets of InsurFact and Information Providers and that the unauthorized dissemination or use of InsurFact Software could cause irreparable harm to InsurFact and/or Providers. You agree to take all reasonable precautions to maintain the strict confidence of InsurFact Software and to prevent any unauthorized use of the Software and its services. You further acknowledge InsurFact's proprietary and copyright interests in the contents of InsurFact databases, which are made available solely for your use in your business. Data provided may be used in presentations or reports to clients. 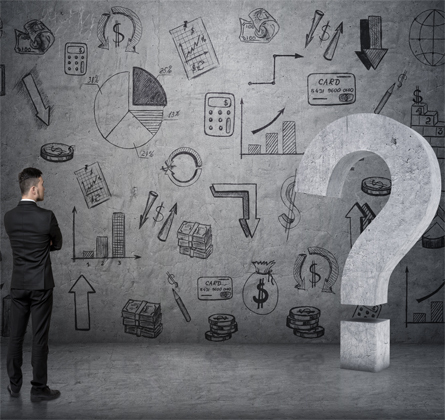 Under no circumstances, however, will you transfer, sell, or lend access to InsurFact databases, nor sell or commercially exploit any information from the InsurFact databases. You agree to pay InsurFact for the license and services provided hereunder in accordance with the established current Price Schedule. All charges are subject to change upon thirty (30) days notice. Charges for professional services will be determined on an individual basis as agreed to by the parties. 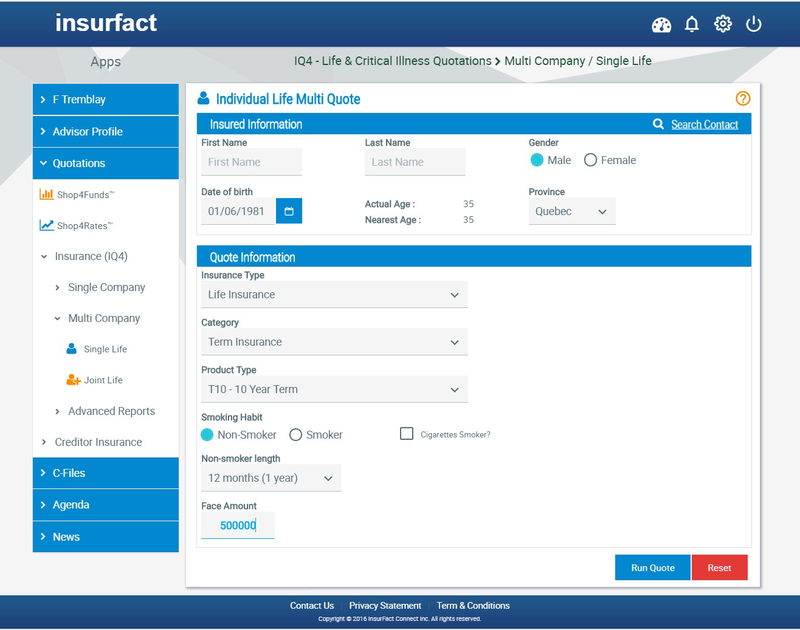 InsurFact will assign to you an InsurFact identification code to insure that access to the InsurFact databases and business management services is limited to use by you and your authorized additional users under your account. You shall take necessary steps to protect the use of your InsurFact ID. You shall be liable for all charges incurred under your account number. Each month, InsurFact will send you an invoice setting forth charges incurred during the prior period. All invoices are payable upon notice. In the event of non-payment, database access may be halted with or without notice. You are solely responsible for acquiring and maintaining all personal computer or devices and communication equipment required to gain access to the database and its services. While the information, data and/or records included in the databases have been obtained from reliable 3rd party sources, no warranties or responsibility is assumed or implied for loss or damage resulting from any inaccuracies contained therein. InsurFact will not be responsible for any delay, failure in performance or interruption of service resulting from a cause within InsurFact's control, InsurFact's sole liability will be the correction of the malfunction within a reasonable time period. You further assume sole responsibility for the use of the service and agree to indemnify and hold InsurFact harmless from any liability or claim of any person arising from your use of the service. a. Governing Law. This Agreement shall be interpreted in accordance with the province of Quebec. b. Assignment. This Agreement or any rights thereunder may not be assigned in whole or in part by you. c. Taxes. You also understand that the license is exclusive of taxes, and you agree to pay all taxes which are assessed by reason of or in connection with this Agreement. d. Entire Agreement. This Agreement constitutes the entire agreement between the parties, with respect to the subject matter thereof. This may only be amended, changed or modified by written instrument signed by both parties hereto. In no event shall this Agreement be modified by any purchase order issued by you regardless of when such purchase order is issued.